While the carriers limit unlimited, the Un-carrier doubles down. Now, every T-Mobile ONE family plan comes with Netflix — at absolutely no extra cost. Bellevue, Washington — September 6, 2017 — T-Mobile has completely disrupted wireless, and Netflix has totally disrupted entertainment. What happens when you bring two disruptors together? Get ready to find out! T-Mobile (NASDAQ: TMUS) today unveiled the company’s latest industry-changing Un-carrier move: Netflix On Us. Through an exclusive new partnership with Netflix, T-Mobile ONE family plans will now come with Netflix — at absolutely no extra charge. You heard that right. T-Mobile ONE families can binge all they want on America’s best unlimited network — on us. So, whether your family is catching up on Stranger Things, The Magic School Bus Ride Again or both, we got you. With this Un-carrier move, T-Mobile is taking on one of the biggest customer pain points out there. The Un-carrier is breaking the carrier bundle. With this Un-carrier move, T-Mobile is tackling one of the industry’s biggest, most recent pain points – the carrier bundle – and the way the carriers push bigger, fatter, pricier packages of content and services on their customers. Carrier bundles are almost always a combination of something you want and something you don’t … all in an effort to jack up your monthly bill even more. Worse, carrier bundles are usually designed to explode after the “introductory promo” runs out, and customers are stuck paying hundreds more each year. The new frontier for carrier bundles is mobile video. As the Internet becomes the Mobile Internet, video is becoming mobile video. This year, Americans have crossed a tipping point, spending over 50% of screen time on smartphones and digital devices versus traditional TV. And the trend is only accelerating — mobile viewing is expected to more than double by 2020. No surprise AT&T and Verizon are trying to exploit this trend, spending billions buying up content and cable companies— all so they can sell it to you in bigger, more expensive carrier bundles. T-Mobile’s strategy couldn’t be any more different. The Un-carrier sees an opportunity to do mobile entertainment right for today’s families … to give you something you want together with something else you want – but at no extra cost. T-Mobile’s partnering with a fellow disruptor to give you the best content on us – all on a network that can handle it. Since the carriers launched unlimited earlier this year, AT&T and Verizon customers have seen their network speeds plunge as their networks struggled to keep up with increased data and video usage. Verizon recently reacted by capping ALL video speeds. 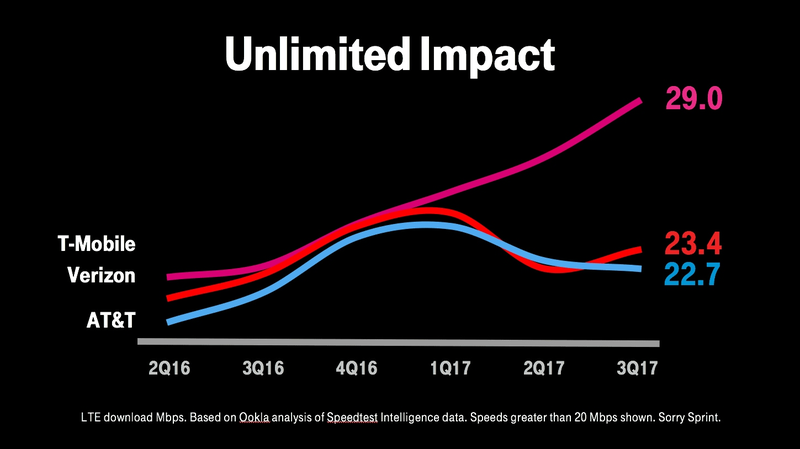 Meanwhile, speeds on T-Mobile’s network have actually increased over the same time period, and in OpenSignal’s recent report, based on 5 billion real customer tests, T-Mobile’s network ranked No. 1 in every category1 — speed, latency and LTE availability — the first clean sweep for any major wireless provider anywhere in the world. 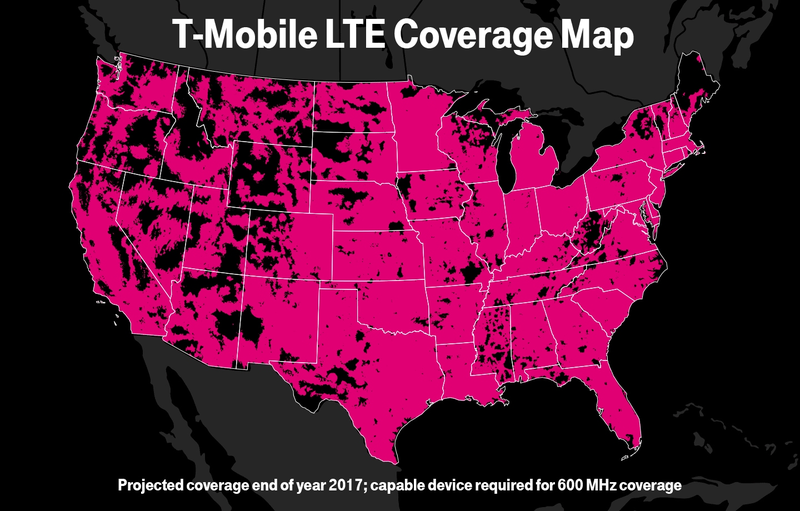 And those dominant network performance results are before T-Mobile’s roll-out of new 600 MHz airwaves across the country. Those new airwaves will provide even more capacity and wide open highways for T-Mobile customers coast to coast. To celebrate this latest Un-carrier move, T-Mobile is throwing the ultimate binge-watching giveaway marathon! Starting at 9 a.m. PT tomorrow September 7, the Un-carrier will be hosting an all-day Netflix Meme-a-thon. Every hour on the hour, fans answer questions from @TMobile Twitter with their favorite Netflix show quotes, GIFs and memes and are entered to win hourly prizes. Prizes include free smartphones, Netflix and T-Mobile swag like T-Mobile ONEsies, and BingeBoxes filled with bingeing essentials such as popcorn, premium headphones and more. To take part, simply follow @TMobile on Twitter. Fans who post their favorite memes (don’t forget to use #NetflixOnUs and #contest) will be entered for a chance to win tickets and an all-expense paid trip to the premier of Netflix’ Stranger Things season two! And, the Un-carrier doesn’t just have two tickets to the premiere … they’re giving away ELEVEN tickets! The winners will be revealed when the Netflix Meme-a-thon ends at 5:30 p.m. PT. Because this is the Un-carrier, getting Netflix On Us couldn’t be simpler. Starting Tuesday, September 12th, qualifying T-Mobile ONE customers can activate their Netflix subscription online, in-store or by calling T-Mobile’s award winning customer care. And, if you already have a Netflix subscription, T-Mobile will cover the cost of a standard subscription for you — meaning you’ll save nearly $120 every year. To qualify, all you need are two or more paid voice lines on T-Mobile ONE with taxes and fees included. Even customers with free lines from the Un-carrier’s wildly popular recent “line-on-us” deals qualify. Customers on Unlimited 55+ or 2 lines for $100 can get Netflix On Us simply by switching to the latest T-Mobile ONE plan. On top of all this, T-Mobile ONE families who get Netflix On Us will also get T-Mobile’s Family Allowances (https://www.t-mobile.com/customers/family-allowances) at no extra charge. Family Allowances allow parents to manage their kids’ phone usage — like setting guidelines for talk time, text messages, download times and which numbers their kids can contact. 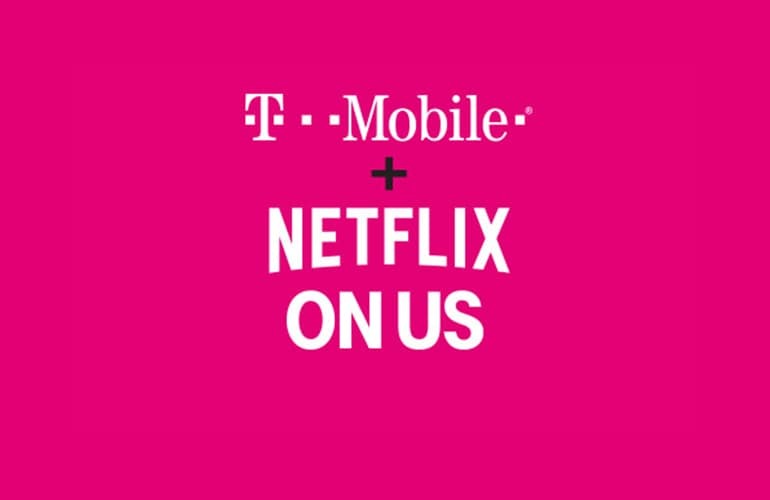 For more information about T-Mobile ONE with Netflix included, visit https://www.t-mobile.com/netflix. Netflix On Us is expected to result in increased customer loyalty and is not expected to impact previously announced company guidance or expectations. This press release includes "forward-looking statements" within the meaning of the U.S. federal securities laws. Any statements made herein that are not statements of historical fact, including statements about T-Mobile US, Inc.'s plans, outlook, beliefs, opinions, guidance, projections and strategy, are forward-looking statements. Generally, forward-looking statements may be identified by words such as "anticipate," "expect," "suggests," "plan," “project,” "believe," "intend," "estimates," "targets," "views," "may," "will," "forecast," and other similar expressions. The forward-looking statements speak only as of the date made, are based on current assumptions and expectations, and involve a number of risks and uncertainties. Important factors that could affect future results and cause those results to differ materially from those expressed in the forward-looking statements include, among others, the following: adverse economic or political conditions in the U.S. and international markets; competition in the wireless services market, including new competitors entering the industry as technologies converge; the effects any future merger or acquisition involving us, as well as the effects of mergers or acquisitions in the technology, media and telecommunications industry; challenges in implementing our business strategies or funding our wireless operations; any disruption or failure of our third parties’ or key suppliers’ provisioning of products or services; material adverse changes in labor matters, including labor campaigns, negotiations or additional organizing activity, and any resulting financial, operational and/or reputational impact; the ability to make payments on our debt or to repay our existing indebtedness when due; adverse change in the ratings of our debt securities or adverse conditions in the credit markets; and other risks described in our filings with the Securities and Exchange Commission, including those described in our most recently filed Annual Report on Form 10-K. You should not place undue reliance on these forward-looking statements. We do not undertake to update forward-looking statements, whether as a result of new information, future events or otherwise, except as required by law.